Northern Goshawks have been prized for many centuries as falconry birds, mainly for their fast flying skills and fearless hunting. These hawks frequently reuse the same nest for many years. If they do not use the same nest, they generally breed in the same area. The Northern Goshawk is North America's largest accipter. 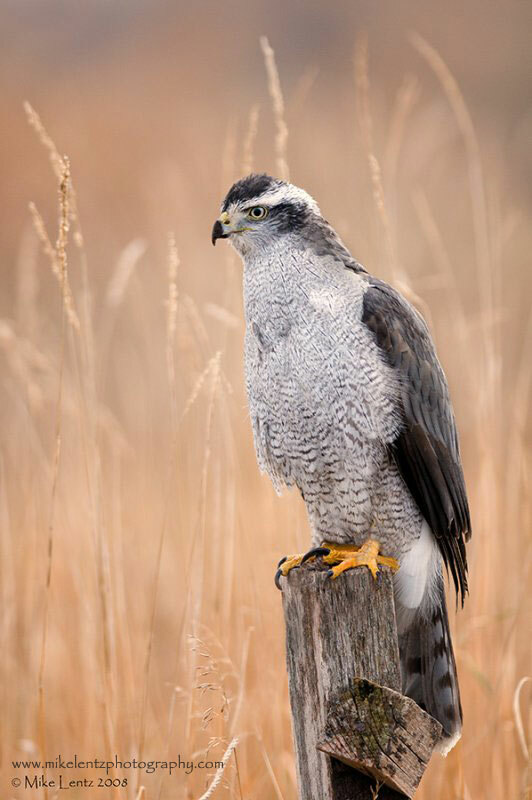 The Peregrine Fund doesn't work directly with the Northern Goshawk, but our efforts in scientific research, habitat conservation, education, and community development help conserve birds of prey around the world. We also supply literature to researchers from our avian research library, which helps scientists around the world gather and share important information on raptor conservation. Though not quite as cosmopolitan as the Osprey or the Peregrine Falcon, the Northern Goshawk is found on many of the world's continents and within a few different types of habitats. In Eurasia, Northern Goshawks can be found in Scandinavia, northern Russia, and northern Siberia, but they don't stop there! This species also can be seen in areas of northwestern Africa, the Mediterranean, Asia Minor, Iran, the Himalayas, and even eastern China. In North America, it is found from western and central Alaska, throughout much of Canada and south to parts of Mexico. 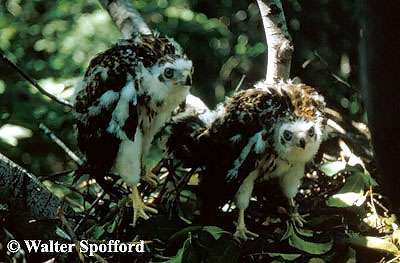 This widely distributed raptor alo can be found inhabiting several islands including Japan, Corsica, and the Queen Charlottes off the western coast of Canada. The Northern Goshawk tends to inhabit both coniferous forests (composed mostly of cone-bearing trees such as pines and spruce) and deciduous forests (composed mostly of trees that lose their leaves at certain times of the year). However, researchers have found that these birds may avoid areas of very dense forest. In England, this species prefers to live in beech and pine woodlands, but can still be found in virtually any type of woodland. In Lebanon, where this species is an occasional migrant or winter visitor, it is often found in stands of cedar trees, that nation's national emblem. Recently, scientists have found that Northern Goshawks are beginning to move into more urban habitats across Europe, including in the middle of some cities! Like many raptor species, those living in the farthest northern portion of their range often migrate south in the winter to areas with milder climates and generally more food variety and availability. This medium-sized bird of prey with its colorful eye and geometrically mottled feathers of black, grey and white is truly built for forest life. Its long tail and relatively shorter, broader wings are perfectly suited for flying safely through dense thickets of trees and maneuvering swiftly after fleeing prey. 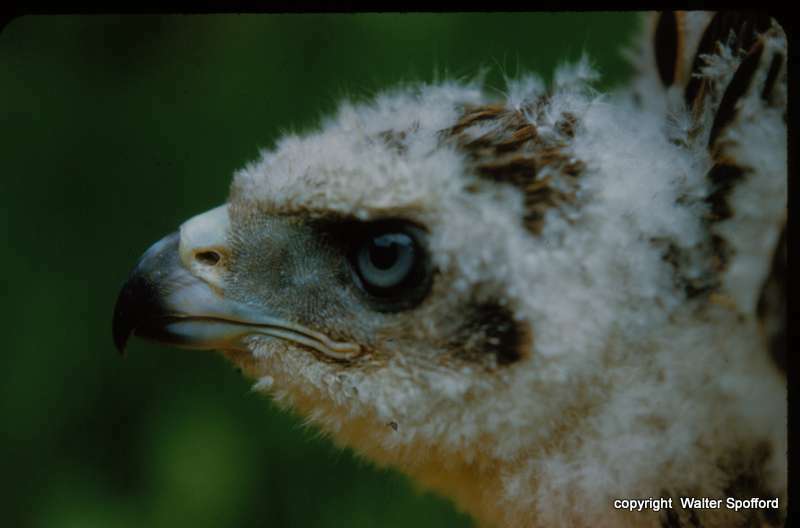 Juvenile Northern Goshawks have pale yellow eyes, but the eye color of the adults varies a bit more. 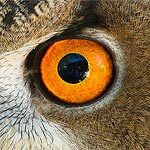 In North America, the goshawks tend to have bright red eyes, but in other parts of their range, the adults' eyes are more often orange. But it isn't only their eye color that differs across their range. European Northern Goshawks tend to have darker mottling on the breast than their North American counterparts, and those found in some far northern regions are more whitish overall. Though normally shy and secretive, the Northern Goshawk will make itself known loud and clear when the safety of its nest and young in question. 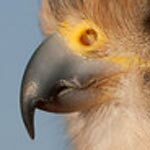 Famous for a vigorous denfense of its nest, this powerful bird of prey has been known to aggressively chase off animals much larger than itself – even humans – from the nest area. Like many raptors, the Northern Goshawk uses a wide variety of flight patterns and styles. The Northern Goshawk typically uses a "flap, flap, glide" pattern common to many raptors. Also like many raptors, they do quite a bit of soaring while in migration. However, when this raptor is in pursuit of prey it can sustain horizontal flight up to 40 miles per hour! There is still much to learn about the Northern Goshawk, however the loss of mature forests, where this species lives, hunts and nests, is likely the biggest threat to its survival. As these forests are cut down for timber or other reasons, Northern Goshawks are losing vital nesting and hunting grounds. Years ago in the United States, shooting and trapping were encouraged by some states. They even paid people $5 for each Goshawk they killed! The practice is no longer in effect in North America, and this bird is now protected by law. However, some people in North America and throughout its range continue to kill these and other raptor species, which is a concern for the long-term conservation of this group of birds. Though adult Northern Goshawks usually don't fall prey to predators other than humans, nestling and fledglings can become victims of tree-climbing or flying predators such as martens and Great-horned Owls. Land predators, such as wolves, might even prey on vulnerable fledglings if they spend time on or close to the ground. Often called "reckless" in its hunting style, the Northern Goshawk is quite determined when pursing prey. It will often crash head-first through brush and branches when after a tasty meal. Wisely, however, they don't always chase prey in thick forest. They often hunt at forest edges either from a perch or by flying low to the ground in the hopes of scaring up prey. They also lie in wait in the dense foliage of a tree, from which to launch an attack on an unsuspecting bird. 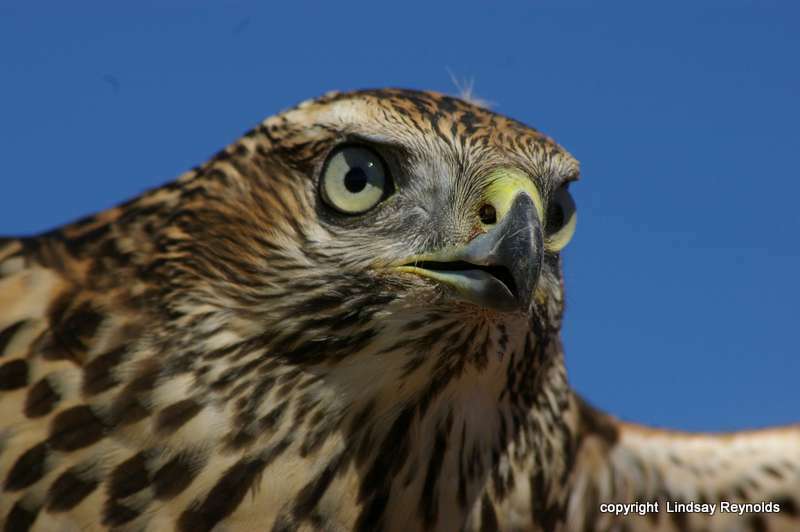 The Northern Goshawk hunts an extremely wide variety of birds and mammals of varying sizes. Depending on where they live, prey species include mice, shrews, chipmunks, jackrabbits, squirrels, grouse, racoons, foxes, hares, geese, doves, woodpeckers, and crows. 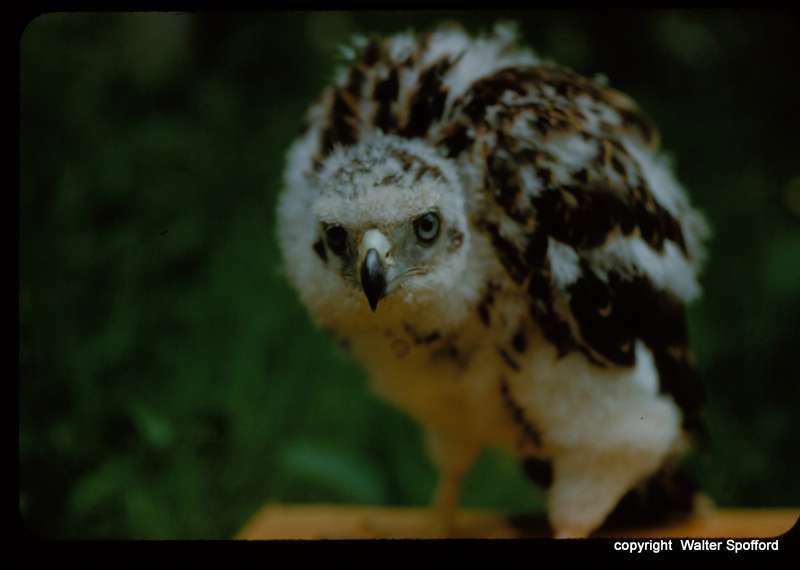 Known as a predator of other birds of prey, Northern Goshawks have been documented hunting owls, kestrels, and Honey Buzzards, among other raptor species. 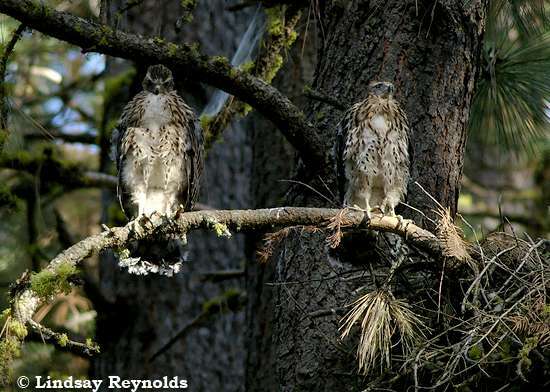 Believed to mate for life, Northern Goshawks can begin to breed when they are 1-2 years old. The pair builds a large nest of sticks, bark and greenery, usually on a branch next to the trunk of the largest tree in an area. A pair may have several alternate nests in their territory. During courtship, these birds of prey participate in some amazing flight displays and loud vocalizations. When the time is right, the female lays two to five bluish eggs that eventually fade to off-white. The male sometimes helps to incubate the eggs, but the female does the majority of caring for and protecting her eggs, which need to be incubated for 35-42 days. At this time, the male is the primary hunter for the family. He is responsible for providing food for himself, the female, and the young. After the young hatch, they remain in the nest until they are 5-6 weeks old. They begin to practice flying and landing skills little by little, first by branching out onto the limbs of their nest tree. Here, they spend time flapping their wings vigorously, even becoming airborne, before landing back on the same branch. After a time, they begin to make short flights, which eventually become longer and longer until the young birds are confident and agile flyers and hunters. At 10-12 weeks of age, the youngsters begin to become independent of their parents' care, though they may stay in their parents' territory for up to one year. The Northern Goshawk can be found in Idaho year-round. 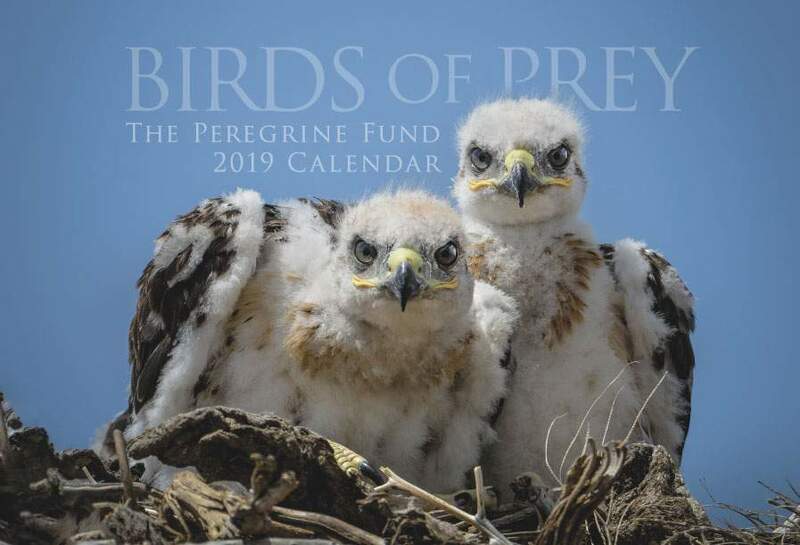 They nest in large trees within the Sawtooth National Forest located only a few hours away from The Peregrine Fund's World Center for Birds of Prey. The World Center for Birds of Prey offers fun ways to learn about birds of prey. Interactive activities, tours, interesting videos and a children's room with activities from coloring sheets to quizzes to costumes are all available for our guests. We also have knowledgeable, on-site staff to answer any questions you may have.